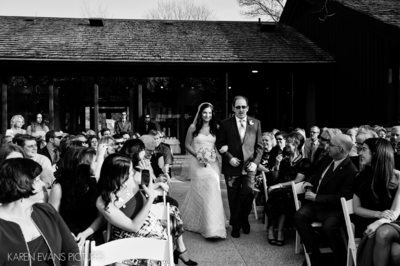 Lisa and Caleb were married in a Jewish ceremony at The Darby House, a beautiful, rustic old property located out West Broad Street in Galloway, on the historical Darby Dan Farm owned by the John Galbreath family, a very famous family in the Columbus area for many many years. 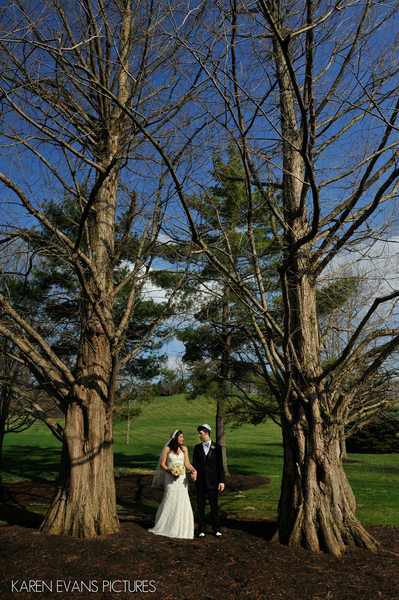 The farm is 1200 acres along the Darby Creek, so picturesque picture opportunities abound. 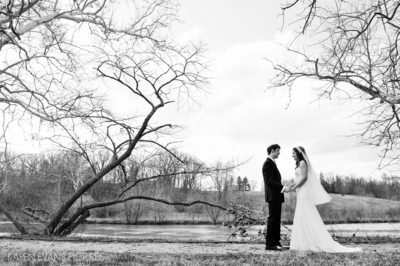 This April day of Lisa and Caleb's wedding was chilly but not too chilly, with breezy sunshine and wispy clouds. 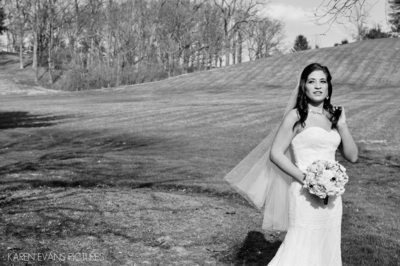 I started with Lisa and her bridesmaids in the getting ready room, while my second photographer hung out with Caleb in preparation for the first look. When we'd arrived, we'd scoped out a perfect spot, along a walkway beside the creek, a little ways from the house so we could have a bit of privacy. 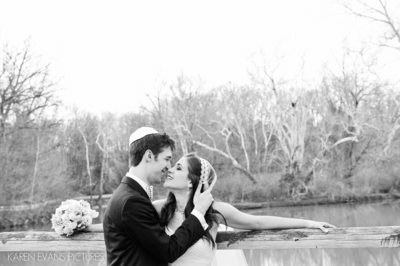 And, when the time came, it turned out to indeed be perfect. We made some great pictures of Caleb admiring Lisa's dress and them spending a couple of moments together before everything started in earnest. After the first look, we met up with the wedding party to take care of some formal pictures of everyone. 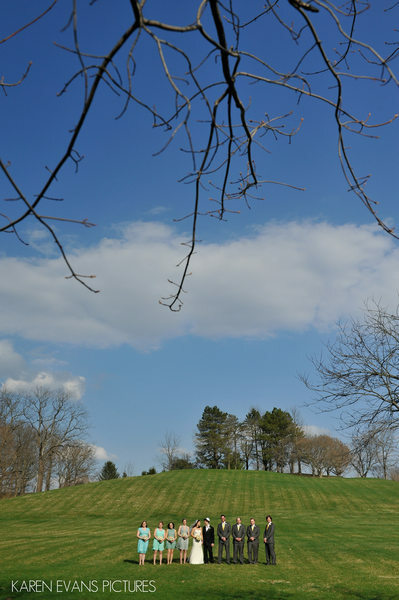 The great thing about the Darby House property is its expanse and natural beauty and the fact that it's on such a large property and so secluded that you can shoot really large shots with lots of sky and not have anything you don't want in the background – it's all beautiful. 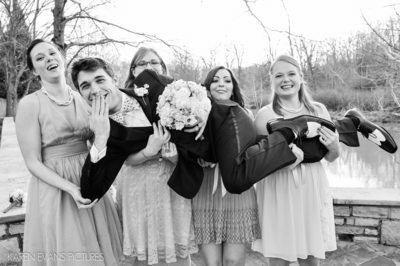 We made a lot of pictures like that for Lisa and Caleb, and had fun clowning with the wedding party for some fun pictures. After the ceremony, we brought Lisa and Caleb back out to make pictures of them alone, with some really lovely shots on the bridge over the creek. 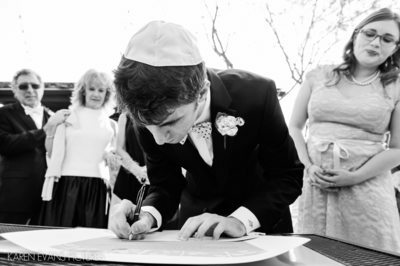 Then it was on to signing the ketubah, which is always one of my favorite parts of a Jewish ceremony to photograph. 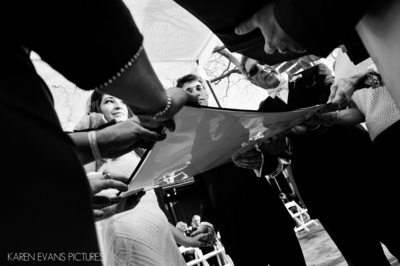 I love that the couple is officially married once that document is signed. 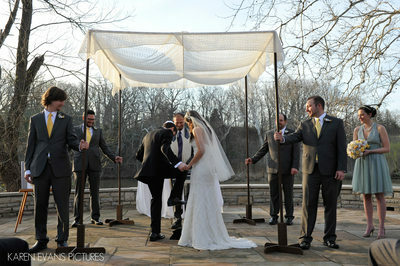 Lisa and Caleb's ketubah-signing was held outdoors on the patio, with family and friends surrounding them close. The sun was just coming down in the sky a bit, so the flare was gorgeous and made the setting look almost like California light. 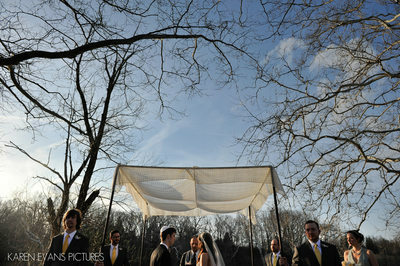 The wind had picked up though, and it was tricky getting the chuppah to keep from blowing over while the groomsmen were putting it together. And then during the ceremony as well. 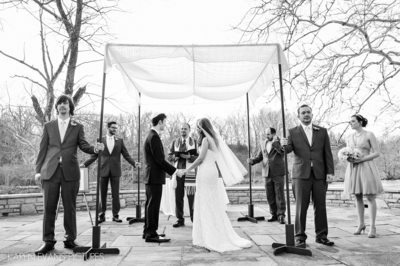 It required that four groomsmen each took a pole to hold it tight for the entire ceremony, with one groomsman pulling double duty holding the chuppah with one hand and the ketubah on an easel with the other. 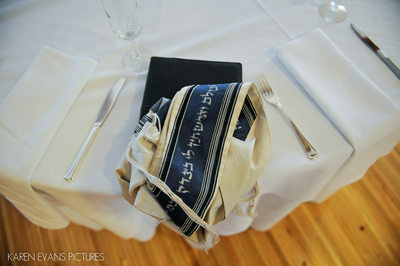 Every Jewish ceremony is different in that the specific rabbi has his or her own ideas of what should and shouldn't be photographed, even when the wedding is not held in a synagogue. 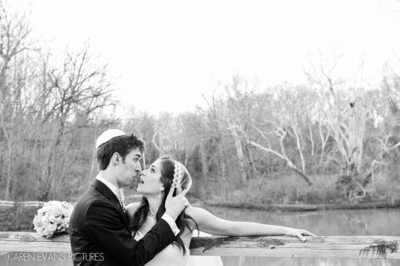 I've been to Jewish weddings at a multitude of locations and have been forbidden from taking any photographs between the processional and the glass-stomp. 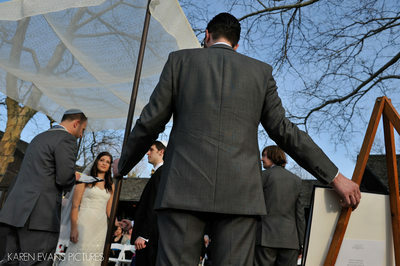 At other Jewish weddings, however, I've been invited – actually expected – to be up around the chuppah to get as close as I can to what's happening. You'll want to be sure to ask your rabbi's preference for this. 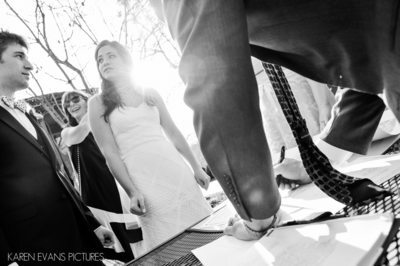 At Lisa and Caleb's wedding, I was able to be as close as I wanted, and was able to make some really great images from different perspectives, including one of my favorites of Lisa and Caleb and both sets of parents all holding an edge of the ketubah, with me shooting from a unique vantage point to get all the hands and Lisa and Caleb's faces as well. 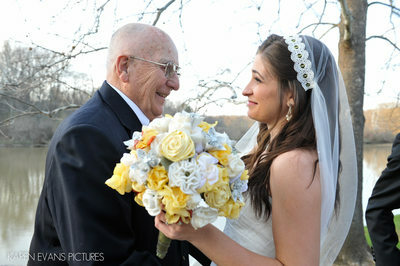 That photo is included in this gallery. So, the ceremony was lovely and the glass-stomp was fun and then it was up the aisle in a flurry, and then a few more pictures, these with family this time, and some cocktails and a festive party. 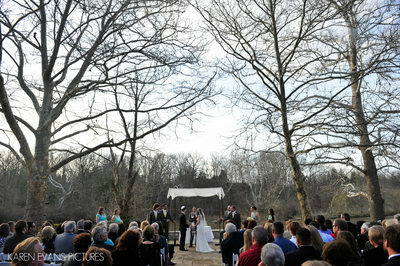 The Darby House was beautifully decorated, the toasts were hilarious, and the cake-cutting was clean – no smashing here. 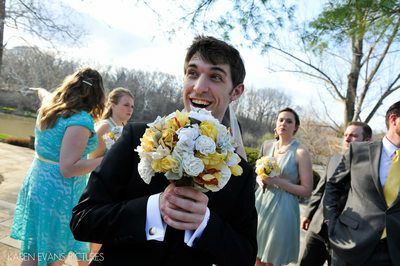 But the hora. 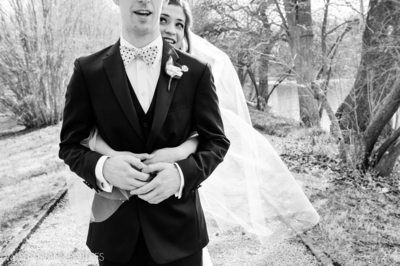 The hora was really great, and it had to do with the horror on Lisa's face at being hoisted into the air on a chair and jostled around and bounced up and down, all the while Caleb could hardly contain his laughter. Poor Lisa! Caleb made up for it with a very romantic first dance and all's well that ends well.